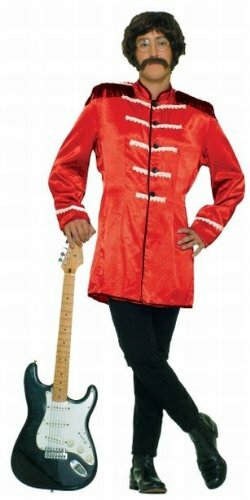 Rock star Halloween costumes are some of the most popular choices for guys during the season. And why not? There are some memorable looks through the annals of rock, most of which have not withstood the test of time. But that's what makes them memorable and fun for Halloween! Credit: amazon.comIs there any album cover more over-the-top (in a classy way) than The Beatles' Sgt. Pepper's Lonely Hearts Club Band? It's got hippie-cool mixed with crazy style. And dressing up like one of the Fab Five on Halloween night is definitely a bold choice. It doesn't have the cheese factor of some of the other rock star costumes below (well, not totally), and that may be a good thing for what you're going after. You're going to need to think instruments to go along with your costume. So before settling in on the look, make sure you have access to a guitar as an accessory. You'll also need to look into a wig and facial hair, as they are not normally included with the Sgt. Pepper's jacket costumes out there. But when it's all together, this is an early rock star fashion statement that holds up really well over the years. It's a rock star costume you can wear proudly! Credit: amazon.comThere are many Elvis variations out there that could've ranged from the 1950s through the 1970s, but this is my favorite of the bunch. It's Elvis' look from his Aloha From Hawaii concert in 1973. Yeah, it's not a late 70s rocker look (and those are popular too for this decade), but this costume is much more in your face and memorable. The white jumpsuit with rhinestones and the big lapel is a look that will go down in rock infamy. Plus because it's Elvis, you've got a bevy of well-known moves to get down before Halloween night. The guy is The King of Rock after all, and he shakes his hips with the best of them. Don't put this costume on without expecting to do a little shake and sizzle on the dance floor because it's going to happen, oh yes. The women in your group will make sure of that. Again, you are going to need to accessorize to get it right. A wig and sunglasses are pretty much a must to go with the costume itself. Credit: amazon.comThe 1980s are a decade without compare when it comes to cheesy rock star costumes. Seriously, it's like the decade DARED people to go absolutely nuts in their style. It makes dressing up like a 1980s rock star for Halloween a ton of fun. And the heavy metal hair band rock star is about as 1980s as you can go. What makes a 1980s rock star costume? It's the pants. The jacket too, but really the pants are the key. Put on a pair of tight leather print flairs and you are a golden rock god of the age! Add in the shiny hair band rock star jacket, and you're look in nearly complete. You're definitely going to need a hair band wig to pull the look together, along with a prop mic. If you've dreamt of rockin' out to your favorite hair band classics, Halloween gives you a mega chance here. It's also a great choice for any 1980s theme party that might come your way. The 1980s are so Halloween costume awesome that the decade gets two listings! How can you walk away from the decade without considering going MC Hammer U Can't Touch This on your crew? Those crazy pants and the dance moves will have any Halloween party you're going to going nuts for your look. Again, like all rock star costumes, be ready to accessorize. You'll definitely need a pair of shades to go along with the costume. And some bling jewelry can add to the old school rapper vibe you are going for. 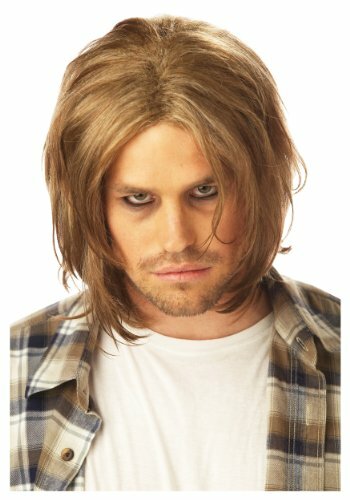 Credit: amazon.comThe 1990s held another rock star costume classic -- the grunge rocker. And the cool thing about this look is: It's all about the wig. The rest of the costume, you may be able to pull together from your closet. A white t-shirt, a flannel shirt, a pair of ratty jeans and you're covered. But the wig...you've got to get it right. It's got to be that subdued rock star rat's nest look. It's got to fall into your face a bit. And it's got to look like you just don't care. Add in a small amount of dark eye liner and you've got the grunge rock star costume down. Rock star Halloween costumes are major fun for guys on the holiday. They are cool and often just the right amount of cheese to get a few fun laughs. If you go there, make sure you really let that inner rock star out! Don't dress the part and then not act the part. Go for it, and you'll be the life of the party, no doubt.